Thursday, November 1st, marked the 40th anniversary of the Russian Diamond Fund. Komsomolskaya Pravda journalists thrust themselves upon a visit to Russia’s main treasure house on the eve of the anniversary so that the Russia people can learn more of the public property kept there. Head of the State Repository for Precious Metals of the Russian Federation Vladimir Rybkin decided to join our small team for a trip to the Diamond Fund. Perhaps he wanted to ensure that everything would go smoothly during our look-see at a “secret facility” that is usually out of reach for journalists, not to mention photographers. Evgeny Gapanyuk, a chief curator of the Russian Diamond Fund, kindly agreed to be our guide. We step into a relatively small room painted black. Every part of it is black – its walls, ceiling and floor. The lights are dimmed. Only the exhibits are illuminated. The Great Imperial Crown is one of the most dazzling exhibits on display. It shines a rainbow of colors. “The crown was made for the 1762 coronation of Catherine the Great,” Gapanyuk told us. Actually, he was speaking in whispers. “Can you hear it? Can you hear how sweet the diamonds ‘sound’? The crown boasts 4,936 diamonds, 75 pearls and a large diamond weighing 56 carats,” Gapanyuk added ecstatically. “You can take a look at the largest stones of our collection over there,” Rybkin said and waved toward a nearby room. There was an air of nonchalance about the way he mentioned the “stones” lying inside a case made of bulletproof glass. The gems looked like assorted pebbles shimmering in the distance. “There’s the famed 26th Congress of the CPSU (the acronym stands for the Communist Party of the Soviet Union – ed. note) diamond, the largest of all at the Fund. The stone was found in 1980. The Alexander Pushkin diamond was found in 1989, it’s a runner-up in terms of size. The Creator diamond is the latest entry in the Fund. In fact, we put it on display a few days ago. We got it from Yakutia last year,” Rybkin said. “How much could it cost – one million dollars or maybe tens of millions?” was the question I couldn’t help asking. “You can come up with any figure. The diamond has a value beyond all price,” Rybkin answered. I had no time to set the price. I could feel Chief Curator Gapanyuk pulling me by the sleeve as he spoke with total candor: “Just take a look at this platinum rose! It was created in 1970 by our jeweler Viktor Nikolayev. He was assisted by Gennady Aleksakhin. The flower is mounted on a spring. It goes into a flap at the slightest whiff. However, there’s no wind in the museum. So the rose sits here motionlessly. The decoration is bedecked with 1,466 diamonds,” Gapanyuk said. Rybkin put on white gloves (he is no exception to the rule which requires that all personnel wear gloves when touching exhibits) and picked up a bar of gold. The bar seemed smaller than a loaf of bread. But it weighed 12 kilograms. Rybkin could hardly hold the ingot in has hands. “The specific gravity of gold is quite high,” said he. The ingot has the year of manufacture imprinted on the side: 1937. It is one of the ingots of gold shipped by the Soviet Union to the Allies for war materiel and services supplied under the Lend-Lease Act. In 1942, the HMS Edinburgh was loaded with 471 ingots of the Soviet gold. However, the British cruiser was sunk by the Nazis in the Barents Sea. In the 1980s, 431 ingots were recovered from the seabed. One of the recovered ingots is now stored at the Russian Diamond Fund. The staff of the Fund also showed us 100 gold nuggets, including the Big Triangle, which is the largest gold nugget ever found on the planet. It weighs 36 kilos. Chief Curator Gapanyuk specified that the nugget had been found by one Nikofor Syutkin, a prospector. 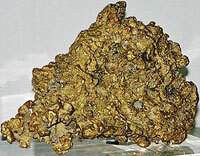 The nugget was found in 1842 at Tsarevo-Alexandrovsky placer in the Urals. We could also have a look around 20 platinum ingots. It is a pity that the staff plainly refused to issue those white gloves to us. We felt a strong desire of touching the President emerald the very moment we saw it in a secret storage room. “The emerald was found in one of the mines of the Sverdlovsk region in 1992. As you can see, it’s quite large, its weight exceeds one kilogram (1,170 grams, to be precise). Therefore, we laid claim to the find,” Rybkin said. The local experts estimated the cost of the emerald at $1.200,000. However, the gem was seized and put under lock and key by court marshals after the mining company failed to repay debts on time. Later the experts of the State Repository for Precious Metals found out that the emerald was not a monolithic gemstone – it was actually a rounded mass composed by three emeralds. Consequently, the Fund offered to purchase it for $150,000. But the owner was not happy with the bid. The parties could not agree on the price for 10 years. Eventually, the owner sold it to the Fund because there were no others bids for the emerald. “Our exhibit is really priceless; it’s one of a kind. No other country has anything like that,” said Rybkin while taking off the gloves.